The following data illustrates Pareto is alive and well vis-a-vis the number of searcher clicks containing four words or less – 80%. 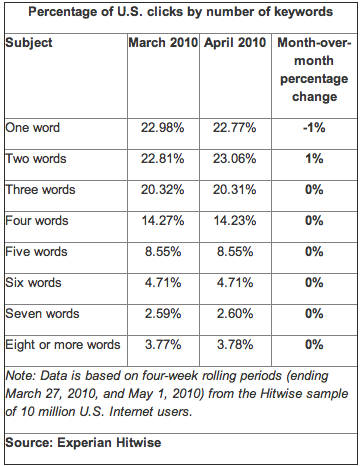 Longer search queries, averaging searches of five to more than eight words in length, were flat between March 2010 and April 2010. The same time period showed that shorter search queries – those averaging one to four words long – also were flat from month to month. Two-word searches comprised the majority of searches, amounting to 23.06 percent of all queries, and increased 1 percent in April 2010. Whereas those with five, six, seven, eight or more words comprise less than 20% of all clicks. The Hitwise data merely confirms what I have been saying all along – the Long Tail is a tall tale. This entry was posted on June 7, 2010 at 3:04 pm and is filed under Clicks By The Number of Keywords, Long Tail. You can follow any responses to this entry through the RSS 2.0 feed. You can leave a response, or trackback from your own site.